The Mace missile was a development of the TM-61 Matador missile, and was initially called TM-61B or “Matador B”. After several modifications, in 1964, it was designated the CGM-13B Mace missile. The main reasons for the new development were the TM-61 Matador’s guidance system, it had limited range and could easily be jammed; and the missile was very cumbersome to move and set-up to fire. The Mace missile had a redesigned airframe, smaller wings and a longer fuselage. The missile was transported fully assembled (except booster) on its zero-length launch trailer. The most important change was the new guidance system, called ATRAN (Automatic Terrain Recognition And Navigation). Flight testing began in 1956 and the Mace A series missile became operational in 1959. The Mace B series upgrade development started in 1959, the guidance system was changed to the AC Spark Plug “AChiever” inertial guidance system. This allowed the missile to fly higher (40,000 ft instead of 1,000 ft) which increased its range (1500 miles instead of 800 miles). The first operational B series missiles were deployed on 1961. This CGM-13B Mace missile S/N 59-4860 was manufactured on 14 March 1961. It is depicted as it was during it’s first assignment to the 4504th Tactical Missile (Training) Wing in Orlando, FL. 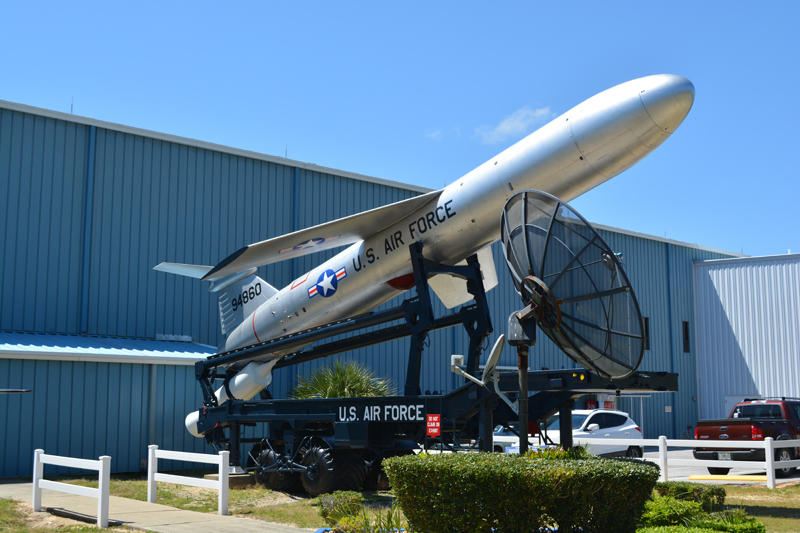 In June 1971, it was assigned to the 4751st Drone Missile Squadron (Air Defense Command), Hurlburt Field, FL where it was used extensively as a target drone until it was donated to the AF Armament Museum for display. Manufacturer	Glenn L. Martin Co.